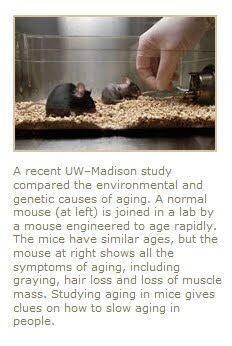 Primate Freedom: UW-Madison: "Animals in Research and Testing"
UW-Madison: "Animals in Research and Testing"
The University of Wisconsin-Madison has launched a new website dedicated to defending its use of animals. Only time will tell whether they will update the site or, like a similar page once produced by the Wisconsin Primate Center, it will be quietly removed when the silliness and vacuousness are finally recognized even by its authors. The university has a tendency to rewrite history to serve its interests so I will take little screen shots to preserve them for posterity, or at least for a while. "This university accepts responsibility..." No, it doesn't and never has. It makes excuses for its repeated oversight failures and puts the consequences for its repeated failures squarely on the backs of the animals that were harmed. Examples of this shirking and transfer of responsibility are too numerous to enumerate, but a few instances will demonstrate the plain facts. 1. When it was discovered that the university had lied in writing to Dane County repeatedly for eight years regarding its use of monkeys from the Henry Vilas zoo, at first they denied the plain undeniable facts, and then "accepted responsibility" for their lies, and then broke their repeated promises not to use the monkeys from the zoo in harmful experiments yet again by sending them to Tulane University to be experimented on there. 2. When it was discovered by the USDA that Ei Terasawa was violating her approved protocols, and as a consequence monkeys were dying, and that she may have been violating her protocol for 18 years, the university "accepted responsibility" by declaring that the discovery demonstrated that the oversight system was working. Although they suspended Terasawa's use of monkeys for two years, there was never an admission that the oversight failure is what led to the problems in her lab. 3. In 2003, the university convened a special committee meeting to review and deal with the multiple problems associated with Michele Basso's methods. In 2009, the university finally got around to suspending her protocols and use of monkeys. But after her threat of going public and exposing the Research Animals Resource Center's alleged failure to provide adequate care and follow-up, they "accepted responsibility" and reinstated her and let her go back to work screwing hardware to monkeys' heads. 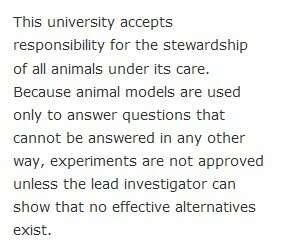 The university makes a simple argument in defense of its use of animals: the ends justify the means. 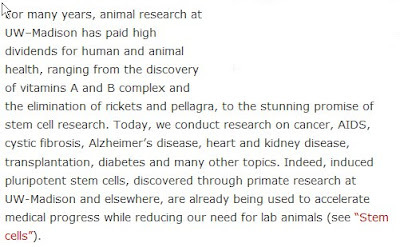 "... from the discovery of vitamins A and B complex and the elimination of rickets and pellagra, to the stunning promise of stem cell research." This is a bizarre statement. The advances they mention, the "elimination" of rickets and pellagra were not due to the isolation of vitamin A and B complex. Beside the false claim regarding the university's role in "eliminating" rickets and pellagra, the new web page points only to its unfulfilled promises: "Today, we conduct research on cancer, AIDS, cystic fibrosis, Alzheimer’s disease, heart and kidney disease, transplantation, diabetes...". Here, we see more wild promises and more suffering: The university argues that it really isn't the ends that justify the means, it is the infinitesimally small likelihood of benefit that justifies the certainty of the animals' misery. 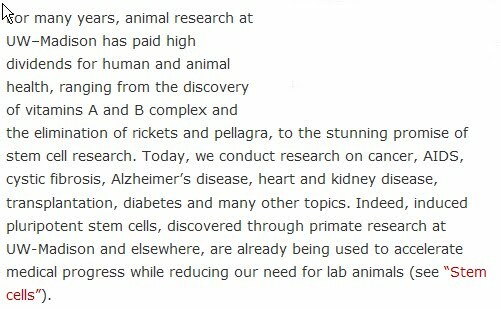 Here's their wildest claim: "Research with animals, like research with people, must pass rigorous scientific and ethical review." This is complete nonsense. There is no ethical review. None. Their silly self-serving claim rests on a single fill-in-the-blank form that is required prior to a project's approval. For those scientists who have a hard time getting the answers just right -- answers that won't cause the USDA to raise an eyebrow in the unlikely event that an inspector happens to choose that particular form to review -- the "oversight" committee provides them with the exact wording they should use. The oversight committee's sole job is to assure that the project comports with the minimal requirements of the Animal Welfare Act. In fact, The IACUC Handbook, Second Edition, Silverman, Suckow, Murthy Eds. 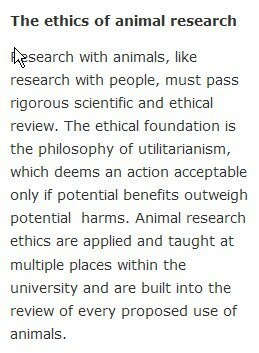 CRC 2007, states clearly that the oversight committees can't make ethical decisions regarding the use of animals, let alone a "rigorous review." Funding agencies and corporate administrators may weigh financial costs against potential benefit in distributing funds, but their is only a limited weighing of benefit against the harm to animals in any setting. "The ethical foundation is the philosophy of utilitarianism, which deems an action acceptable only if potential benefits outweigh potential harms." They have shot themselves in the foot. There are only actual costs to the animals; musings about the potential costs are distasteful and underscore the hollow claim that the animals' experiences are given even a moment's notice. "Animal research ethics are applied and taught at multiple places within the university and are built into the review of every proposed use of animals." Gibberish. If anything about the ethics of animal use is "taught" to the aspiring vivisectors it must be by means of rote recitation. Clearly, from the above mealy-mouthed nonsense, nothing approaching critical though is attempted.